The by-laws of The Internet Corporation for Assigned Names and Numbers (ICANN) state that it is a non-profit public-benefit corporation which is responsible at the overall level, for the coordination of the “global internet's systems of unique identifiers, and in particular to ensure the stable and secure operation of the internet's unique identifier systems”. As key stakeholders of ICANN are spread across the world, much of the communication discussing the work of ICANN takes place over email. 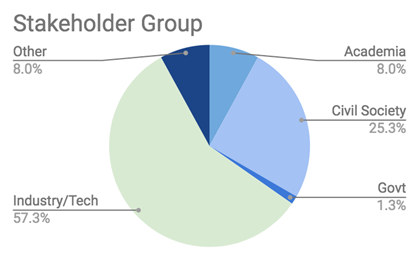 This analysis of the diversity of participation at the ICANN processes, through a study of their mailing lists, was undertaken by Paul Kurian and Akriti Bopanna. The by-laws of The Internet Corporation for Assigned Names and Numbers (ICANN) state that it is a non-profit public-benefit corporation which is responsible at the overall level, for the coordination of the “global internet's systems of unique identifiers, and in particular to ensure the stable and secure operation of the internet's unique identifier systems”.Previously, this was overseen by the Internet Assigned Number Authority (IANA) under a US Government contract but in 2016, the oversight was handed over to ICANN, as a global multi-stakeholder body. Given the significance of the multistakeholder nature of ICANN, it is imperative that stakeholders continue to question and improve the inclusiveness of its processes. The current blog post seeks to focus on the diversity of participation at the ICANN process. As stakeholders are spread across the world, much of the communication discussing the work of ICANN takes place over email. Various [or X number of ] mailing lists inform members of ICANN activities and are used for discussions between them from policy advice to organizational building matters. Many of these lists are public and hence can be subscribed to by anyone and also can be viewed by non-members through the archives. Finance & Budget mailing lists. We looked at the diversity among these active participants by focusing on their gender, stakeholder grouping and region. In order to arrive at the data, we referred to public records such as the Statement of Interests which members have to give to the Generic Names Supporting Organization(GNSO) Council if they want to participate in their working groups. We also used, where available, ICANN Wiki and the LinkedIn profiles of these participants. Given below are some of the observations we made subsequent to surveying the data. 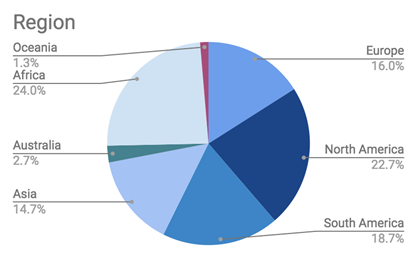 We acknowledge that there might be some inadvertent errors made in the categorization of these participants, but are of the opinion that our inference from the data would not be drastically affected by a few errors. A total of 218 participants were present on the 5 mailing lists that were looked at. Of these,, 92 were determined to be active participants (participants who had sent more than the median number of mails in their working group) out of which 75 were non-staff members. 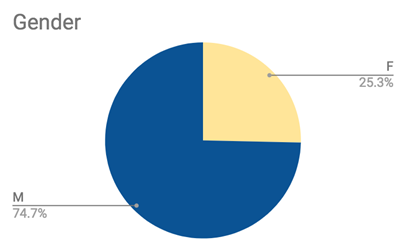 Out of the 75 participants, 56 (74.7%) were male and 19 (25.3%) were female. 57.3% were identified to be members of the industry and technological community and 1.3% were identified as government representatives. 8.0% were representatives from Academia, 25.3% represented civil society and the remaining 8.0% were from fields that were uncategorizable with respect to the above, but were related to law and consultancy. Within Asia, we identified only one active participant from China. The vast number of the people participating and as an extension, influencing ICANN work are male constituting three fourth of the participants. The mailing list are dominated by individuals from industry.. This coupled with the relative minority presence of the other stakeholders creates an environment where concerns emanating from other sections of the society could be overshadowed. Only 14.7% of the participants were from Asia, which is concerning since 48.7% of internet users worldwide belong to Asia. China which has the world’s largest population of internet users (700 million people) had only one active participant on these mailing lists. ICANN being a global multistakeholder organization should ideally have the number of representatives from each region be proportionate to the number of internet users in that region. In addition to this, participation of women on these mailing lists need to increase to ensure that there is inclusive contribution in the functioning of the organization. We did not come across any indication of participation of individuals of non binary genders.